A farmer’s livelihood depends on keeping track of records. Records of rainfall, commodity prices, fertilizer applications, seed planting rates, when pesticide was applied last, and more. Without accurate records, the business suffers. Yet the farming sector has been slow to adopt new technology–farmers often opt to keep much of their files with them in the front seat of the pickup or in office filing cabinets. But in today’s era of competition and rapidly evolving information technology, the old-school approach is sure to eat into profits. FarmLogs (also known as AgriSight, Inc.), headquartered in Ann Arbor, Michigan, provides easy-to-use record keeping technology for farmers all across the United States. Co-founder Jesse Vollmar grew up on a row crop farm in Caro, Michigan. He was always drawn to technology, and was frustrated with the lack of agricultural applications. So in fall 2011, Vollmar partnered with Brad Koch, his college friend from Saginaw Valley State University, to start developing a record keeping technology system for farmers. Now just a few years into the project, FarmLogs software is utilized by over 15 percent of U.S. farms. This includes $12 billion in crops. Once the company secured seed funding, “we never looked back,” says Vollmar. Growth continues; as of December 2014, FarmLogs received $10 million in financing to go toward new hiring and product innovation. With this capital, the company is looking to double its workforce from 22 to 43 employees. 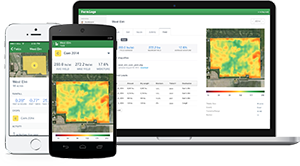 FarmLogs will grow its cadre of data scientists, designers and engineers to aggregate data, including commodity prices, rainfall amounts, crop rotation records and more, into the cloud. Farmers who use FarmLogs can access this data on their smartphones. Current features include satellite maps of fields, profit calculation, grain inventory status, soil maps, field performance and more. This spring, according to Vollmar, FarmLogs will use some of the new cash infusion to launch new premium features. These include market data collection, crop health monitoring and remote servicing. New investors include SV Capital of San Francisco and Y Combinator president Sam Altman, who contributed toward the $10 million round, as did prior investors Hyde Park Venture Partners and Hyde Park Angels, both out of Chicago. Huron River Ventures of Ann Arbor and Drive Capital of Columbus, Ohio also invested. Vollmar says the company has chosen to focus its efforts on helping crop farmers. “We have a narrow scope to keep the quality high,” he says. Most of the company’s advertising efforts are online, and according to Vollmar, FarmLogs is usually the first result listed in a web search for ‘”farm management software”. The company also gets the word out by being present at farm trade shows. In July, FarmLogs moved into new digs in Ann Arbor, close to the University of Michigan, which was no accident. “The university is a huge reason why we’re in Ann Arbor,” Vollmar says, citing its resources and talent-rich students and alumni. The long-term vision for FarmLogs, says Vollmar, is to help farmers grow row crops as efficiently as possible, while enabling them to easily use cloud-stored and aggregated data for sustainability and profitability.